Today, the demand for gluten-free foods is higher than ever before. As a result, more and more products claiming to be gluten-free enter the market, but not all are safe for those consumers requiring a gluten-free diet for medical reasons. An easy way to identify safe and reliable gluten-free foods is to look for the Gluten-Free Certification Program trademark. An advanced automated integrity management system now brings gluten-free safety to the next level. LEBRING, Austria & MILTON, Ontario & HOUSTON - Feb. 28, 2017 - PRLog -- Celiac disease and non-celiac gluten sensitivity are increasing trends that can be observed throughout the world. Between these two groups they make up approximately 9 percent of the global population. Celiac disease is a chronic autoimmune disease caused by the consumption of gluten-containing foods such as anything that contains wheat, rye, and barley. For those affected, there is no medical cure; the only remedy is to stick to a strict gluten-free diet. Thus, being able to find safe gluten-free products is of topmost importance. However, the great number of different gluten-free label claims in the market often leaves consumers confused and overwhelmed. The Gluten-Free Certification Program (GFCP), managed by the Allergen Control Group (ACG) and endorsed by North America's two most trusted consumer celiac societies, aims to improve this situation. Unlike other gluten-free certifications, which rely solely on costly and unreliable product testing processes, the GFCP verifies a facility's ability to safely manage the production of gluten-free products with an annual third party audit against globally recognized and science-based food safety protocols. Thus, products permitted to display the GFCP trademark are reliably gluten-free and without the risk of potential gluten cross-contamination. ACG's certification program is proving to be widely accepted by industry and consumers – it currently controls labels of over 5000 products and certifications for 270 plus manufacturing facilities – and it is growing quickly. To maintain consumer assurances and the integrity of both the GFCP standard and certification process, ACG now implements an automated integrity management system developed by the Austrian company Intact Systems. In the future, this system will also provide added functionality for access and visibility for efficiently managing technical communications between ACG, their valuable customers and licensed certification bodies. 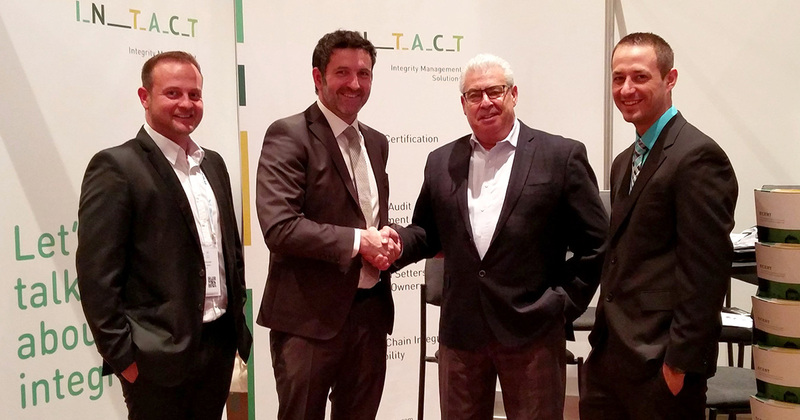 "The Intact folks were knowledgeable and helped us understand how we might be able to better manage the complex relationships between products, brand owners, manufacturing sites, certification bodies and auditors," says ACG's CEO Paul Valder. "We view Intact as a key strategic partner to support ACG's medium to long-term exponential growth plans, within the global market." The signing ceremony took place at the renowned GFSI Global Food Safety Conference 2017 in Houston, TX between Paul Valder and Thomas Lorber (CEO, Intact Systems). From Intact's side, Erwin Wassler (Director Sales) and Dirk Otto (Director Business Development US) also joined the ceremony.